The African wild cat looks almost exactly like a domestic cat. 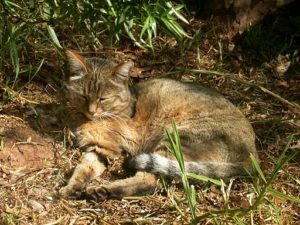 Here on the blog, we often talk about ways to improve your cats’ life by satisfying the instincts passed down from their ancestors, the African wild cat. But just how did they go from being desert-dwelling predators to being the purring lap cats that we know today? How are domestic cats different from wild cats? For the 12,000 years that cats have been the friends of humankind, their genes haven’t changed much. Unlike other domestic animals like pigs, sheep, or cattle who have major morphological differences, the primary difference between modern cats and their wild cat ancestors is their markings (and their fondness for a certain fur-less two-legged creature). In fact, domestic cats’ coat patterns were indistinguishable from wild cats until the Middle Ages. How did domestication take place? Cat parents often joke that cats domesticated us, and some scientists agree. A popular theory is that as humans began to settle down into agricultural societies, their grain stores would attract pests like mice. Since they are the favorite prey of cats, the mice in turn would attract cats. The cats were then likely encouraged to stick around by being rewarded with treats of meat and ear rubs. For similar reasons, cats were very popular with seafaring communities as mousers aboard ships. Since subspecies of the African wild cat are also found in Europe and Asia, but not in the Americas, scientists believe they arrived by boat. Indeed, a cat arrived here on the Mayflower. However, new studies suggest that cats may have come to the New World much sooner than that, tagging along with the vikings. Wherever cats may have come from, one thing is for certain — cats seem to love people as much as we love them. Photo by Sonelle on Wikimedia Commons.